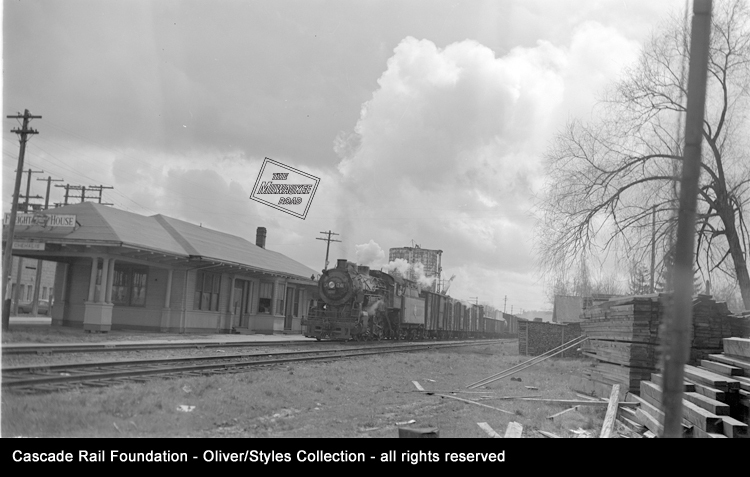 MILW 2-8-0 1241 leads a train through Chehalis, WA in April, 1953. Cascade Rail Foundation and the Coast Division of the Milwaukee Road Historical Association are sponsoring a free event on Saturday, October 27. We will have several presentations about the history of the Milwaukee Road. This is a great opportunity to socialize with others interested in the history of the railroad. All are welcome! We will be meeting in the Multi-Purpose Room at the south end of the Centralia Amtrak depot. Photos of the Milwaukee Road in Eastern Washington and Idaho by David Klawunder. We’ll be continuing where we left off in March. Photos of the Milwaukee Road south of Tacoma from the Cascade Rail Foundation collections. Color movies of the last passenger fan trip on the Milwaukee mainline in 1965 and the Port Townsend barge slip being switched by steam. (These were shown at the MRHA convention in Olympia this year). Bring your photos, artifacts, models, memorabilia and other items for display. ​After the event, consider staying in town to enjoy the work of some of the best railroad photographers in the Pacific Northwest at the Autumn Leaf Railroad Slide Show. It will be at King Street Cove – 200 S. King Street in Centralia. The show begins at 4:00pm sharp! 10:00 a.m. to 3:30 p.m. The facility does allow for sales of your memorabilia, paper and model railroad items. However, tables are limited. Table space is first come, first serve. You are welcome to bring a table of your own and set it up if there is space. The event is FREE, although a $3 donation is encouraged to offset the expense of the meeting room.